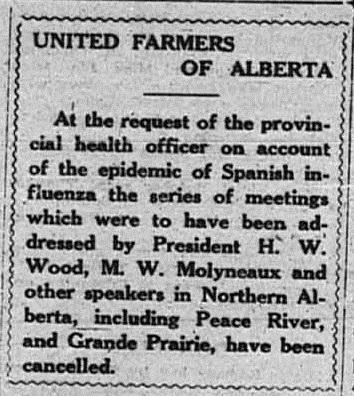 In the latter portion of 1918, Camrose, Alberta was faced with an overwhelming sense of the need for disease preparation. Preparing for what had struck the Eastern Provinces with such vigor, the Spanish Flu or Spanish Influenza instilled in Camrose residents an anxious responsibility for the epidemic that was to come from the East. One of the first documented cases of the Spanish Influenza in Camrose was J. C. Kerr, an Irish born resident, who died at the age of thirty three to the influenza on December 8, 1918.2 His death made front page news in The Camrose Canadian December 12th, 1918 issue.